After a great burst of soccer in Philadelphia in the early 1890s, the late 1890s and early 1900s were a time of little growth and some retreat. The reason for this was the severe economic depression that swept through industrial America in the mid 1890s. The immigrant English, Irish and Scottish neighborhoods of Philadelphia that had been instrumental in establishing the city’s first leagues were particularly hard hit by the economic crisis. Clubs and leagues folded as their members faced the more pressing concerns of daily existence in a depression. In view of the mass wave of patriotism that accompanied the lead up to the Spanish American War in 1898 and the widespread questioning of British motives and policy in the Boer War of 1899-1902, the identification of soccer as a sport of British immigrants was also a factor. In the first instance, many native-born Americans refused to support a “foreign” sport while, in the second, many were scornful of supporting a “British” sport. By the middle of the first decade of the Twentieth century, such sentiments were becoming eclipsed and a new soccer boom was burgeoning. Improving living conditions arrived with rising employment so that factory workers might have the means and opportunity to chose their leisure. That the native-born children of immigrant families were playing soccer, often enough through the efforts of organizations such as the Lighthouse as well as ethnic social clubs, helped to make it more of an “American” activity. The game also enjoyed increasing support by elite sections of Philadelphia society. The Associated Cricket Clubs League was thriving, the establishment of teams at local universities was growing, newspaper coverage was enthusiastic and knowledgeable, and workplace-based soccer teams were sponsored by Philadelphia industrialists. By the end of the first decade of the new century, the city had at least five leagues and scores of teams. That the Public Schools Athletic League was ready to adopt the game, the Fairmount Park Commission to allow soccer to be played in its parks and the Playgrounds Association to equip the city’s playgrounds with goals were all further indications of how soccer was entering Philadelphia’s athletic mainstream. Tacony was a workplace-based team, supported by the Disston Athletic Association, which was itself a project of the Disston Saw Works for its employees. Founded by the English-born Henry Disston in 1850 as the Keystone Saw Works, by the 1870s the Disston Saw Works were on their way to being the largest saw making facility in the world. Henry Disston was an exemplar of Victorian utopianism: he believed that he had an obligation to improve the lives of his workers and their families. He supported the construction of homes for his employees and provided the financial infrastructure for employees to purchase them. The company also funded the construction of a meeting hall, a library and a music hall. Though he died in 1878, his heirs shared his philosophy, a philosophy which helped to guide the early development of what is now the Tacony section of Philadelphia. The Tacony team would be known by a variety of names throughout their history—Philadelphia Tacony, Tacony F.C., Tacony Disston, and Philadelphia Disston—but their nickname would always be “The Sawmakers.” By 1910 Tacony had been playing in the Pennsylvania League for five years. Their debut game in the Pennsylvania League had been against Albion, who would be the eventual winners of that year’s league championship. Tacony gave the Philadelphia soccer community a glimpse of what was to come when they played Albion off the pitch. A record 29 teams entered the American Cup competition of 1909-1910. The competition, founded by the American Football Association, the first non-league soccer governing body in America, had first been held in 1885. After being abandoned in 1899, the competition was revived in 1905. Philadelphia was well represented in the 1909-1910 cup series with four teams making it to the second round of sixteen teams. Hibernians and Corinthians both failed to advance to the next round, the Hibs thanks to a 2–0 loss to Jersey AC, Corinthians when they lost 1–3 to Paterson Rangers. Thistle forfeited when, after two drawn games, they refused to travel Massachusetts to play the Fall River Rovers for a replay. In the next round Tacony faced the Paterson Rangers, who played in the semi-professional National Association Foot Ball League, away. The Philadelphia Inquirer match report of March 7, 1910 described Tacony as playing “classy ball,” and as being “superior at all points of the game,” so proving themselves “in the front rank as being one of the best soccer teams in the country.” Inside left Thomas Hyslop, a former Scotland international and veteran of English first division play with Sunderland and Stoke, “put up a star game,” scoring two goals in the 4–1 victory. Bassett, the Paterson right fullback, and Stone, the right halfback must have had a bad day: Tacony’s outside left John Smith scored the other two goals. Tacony was now one game away from the American Cup final. To get there they would have to best the Fall River Rovers. 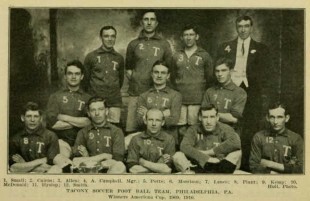 The Rovers had made it to the semifinals the previous year and, along with Philadelphia Hibernians, had been one of only two American team to beat the Pilgrims on their 1909 tour. On March 26, 1910, the Rovers met Tacony at the Tacony Ball Park at State and Unruh streets. After being postponed for one week because of rain, on April 24, 1910, at the Harrison Oval in Newark, NJ, Tacony faced the Scottish-Americans in the American Cup final. Tacony maintained their lead into the second half , but with the wind at the Scottish Americans backs, many thought the Newark team “would have no difficulty in winning out.” Soon, Tacony left fullback John Allen appeared to foul the Scottish American’s inside right Fenwick. 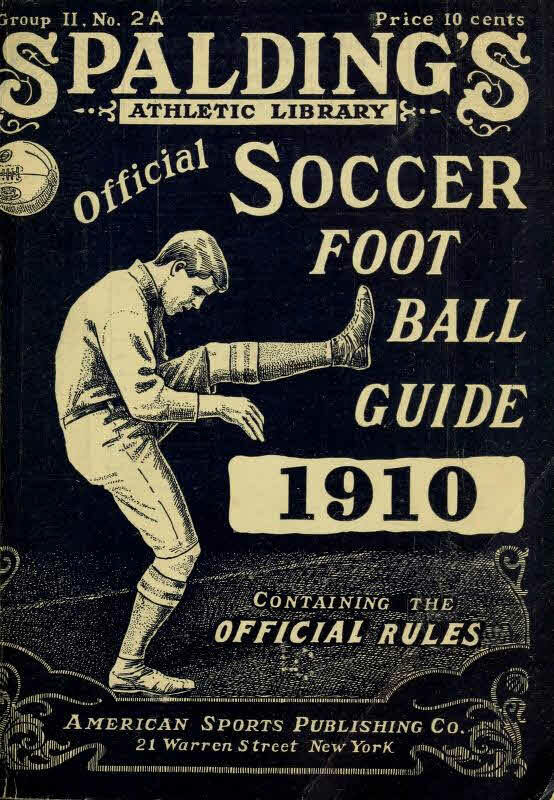 Despite the protest of the Tacony players, referee John Nesbitt of New York awarded a penalty kick, which was converted, and the game was now tied. Both sides pressed furiously but the Scottish Americans couldn’t penetrate Tacony’s defenses. Tacony was attacking when a defender deliberately handled the ball. Tacony were awarded a penalty kick which Morrison converted “by safely planting the sphere in the far corner of the net.” The Scottish Americans had a few more chances but “the aggressiveness of Tacony was too much for the ‘Scots,’ and they fairly played the latter off their feet in the last ten minutes.” Final score: Tacony 2, Scottish Americans 1. For the first time since the John A. Manz team had won the cup in 1897, a Philadelphia team was the winner of the American Cup. They had not lost a friendly, a league, or cup match the entire season with only two draws in league play. As the 1910 Spalding Official Soccer Foot Ball Guide, then the official record of the American game said, “It cannot be denied that Tacony was ‘the team of the year.” Philadelphia was ready to make its mark on the American soccer scene. A version of this post originally appeared on February 18, 2010. Really beginning days of Philly Soccer are unforgettable. In the beginning of the 1900s Philly Soccer became favorites of all. Philly Soccer History was quiet interesting. accessing a bogus web page somewhat than true one. Thanks for sharing your thoughts about 1910 American Cup.